Over the years, we’ve helped thousands of MCAT test takers increase their scores to competitive levels and it’s obvious that Chem/Phys and CARS are two of the most challenging sections for most. 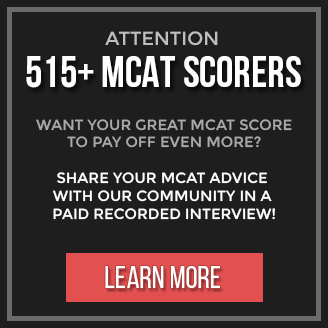 As we research and interview 510+ scorers and their strategies they used to dominate the MCAT, we also single out those who scored over 130 (we usually single out 132 scorers) in particular sections and try to drill down on the most powerful strategies they used for those specific sections. In this post, we’re going to provide you with some of the most effective 130+ C/P scorer strategies which you can apply right away to increase your C/P score fast and get over that 130 level yourself. How Do 90+ Percentile MCAT Scorers Dominate C/P and Every Other Section on the MCAT? ​An interesting problem a lot of premeds face for this section is low scores because of mental pressure that is a result of the timer running. When we’re going slow, we try to speed up. In our hurry, our reasoning abilities aren’t as strong and our score suffers. This section doesn’t require you to have some super reasoning abilities. In fact, it just requires basic math and simple reasoning. Every premed has the cognitive abilities to conquer this section. The key is to take a C/P exam that’s not timed. Forget about how fast you’re working. Go through it in a state of complete calmness. Especially for math problems. Work through those at a slow pace. Go through the passages and graphs and really try to figure out the right answer. If you forget something, guess, make a note of it, and move on. Most of the time you’ll notice that the right answer is always there in your head, if you just give it a little time and push for it to come up. Once you do an untimed test like this for C/P, your confidence will increase. As your confidence increases, do it again but with less time. Keep this going until you can maintain your efficiency in under 135 minutes. Have you joined the Free 10-Day 510+ Scorer MCAT Strategy Email Course yet? We'll send you a different 510+ scorer MCAT prep strategy everyday for 10 days! Enrollment is free for a limited time. This is one of the sections where you can improve your score DRAMATICALLY with practice. Every 130+ scorer in this section greatly emphasized the importance of practice and how practice is what makes this section in particular, one that you can truly master. Practice unit conversions, working with equations, dividing and multiplying scientific notations, rounding, etc. If you lack understanding, go in-depth with external resources like Khan Academy videos. Or ask someone. However, like we’ve mentioned already, make an honest attempt at reasoning out the answer. Reasoning also requires practice and as you get better at it, your confidence will increase, including the speed at which you get right answers. You must also do as many problems as you can. Find a good resource that gives you a lot of problems for C/P and use those to increase your math + problem solving skills you need. When you build this muscle, you’ll not only get stronger at problem solving which is extremely important, but you’ll also make a lot less calculation mistakes (if any). Generally, most external resources that provide you with practice problems for C/P, give you much harder problems than what you’ll see on AAMC exams. Which is a good thing because when it comes to the actual exam, you’ll fly through it! Once you’ve done the questions, look into why you got the answer right AND why you got the answer wrong. Read the explanations – they’ll reinforce your rationale, you’ll learn better, and you’ll be able to critically look at how you thought about the question and what you can do differently next time. You also need to ask yourself the right questions when you’re reviewing. Asking yourself the right questions can make the difference between seeing a higher score on your next practice exam or a lower/same score. It’s extremely key. One of our bonus resources for anyone who downloads the strategy guide, is the ‘Mistake Analysis & Tracker Worksheet’ that is a template to use when you’re reviewing, with prewritten questions to ask yourself, so you can track with top scorer level efficiency. Did I get this wrong because I misinterpreted key information in the passage and/or question? If you keep coming back to this being your most common issue, it simply means that you need to get yourself better focused, with increased stamina. There are several ways to do this which we cover in the strategy guide PDF – one is to simply practice more, as much as you can. Did I get this wrong because I didn’t know or improperly applied equations/concepts? If you keep coming back to this being your most common issue, it simply means that you need to brush up on your content knowledge. Content review is a good idea here. Also if you really want to take this a step further, make notecards. We cover proven top scorer strategies for creating extremely effective notecards in the strategy guide as well. Of course, be sure to make use of every single AAMC C/P resource; Physics QB, Chem QB and C/P Section Bank. For C/P, it’s recommended to give your most attention to getting the basics and foundations down, instead of details (even though certain details can be useful). If you want a 130+ in C/P, it’s highly unlikely that it’ll happen if you don’t master the basics and master the highest yield topics. Value these MORE than learning the details. Once you’ve achieved complete dominance over these, then go to the small details. Don’t get sucked into learning details, wasting time, when you know those details are probably not going to be on the exam. One of the most agreed upon ideas from 130+ scorers in this section is that one doesn’t have to be a chemistry or math genius to master this section. The main skills you need in this section revolve around simple equations, foundational concepts, etc. The key is to be aware of when you need to make use of them and also to be able to use them with confidence and speed. At the same time, completely minimizing any possibility of making silly mistakes. First and foremost, rounding and scientific notation is something 130+ C/P scorers recommend to get very comfortable with. Simply because it makes doing the math in problems a lot easier. Generally, however, you won’t find complicated math problems on the exam. They’re usually very simple and one-step problems. Equations you’ll need are also simple like f=mg or e=hv, etc. When you catch yourself doing some complicated multi-step problem that takes more than a minute, consider that a red flag to reassess your approach. Also, a lot of top scorers claim that knowing units is absolutely necessary. It’s claimed to be one of the most important skills to have on this section. Get comfortable with converting units. To the point where even if you don’t remember an equation you require, convert units until they match the units of the answer options (which requires converting between powers of 10). Write out the units every time. A lot of the math requires dividing by negative exponents or multiplying different units together. With the time pressure, it’s easy to get worried if the answer you got isn’t included in the answer choices. Which is why it’s important to be able to convert those units with ease. Also know the prefixes like centi, tera, pico, etc. A great mnemonic to help you with C/P is LARS (Left Add, Right Subtract). Essentially, if you toggle one decimal to the right, you subtract an exponent from the power of 10. And if you move one decimal to the left, you add. So 6.7 x 8^4 = 67 x 8^5. Simple? Yes – but extremely helpful in this section. Also, another note on mnemonics: use them as much as you need to memorize but be sure to give your maximum effort to actually understand concepts and not just memorize them. The MCAT forces you to apply the concept in ways you probably never have applied them before, which means that if you just ‘know’ concepts and don’t ‘understand’ them, you’re going to have a hard time with this exam. Memorization is step 1, understanding is step 2. Don’t mistake them to be the same thing. ​When it comes to resources for this section, EK C/P books are well spoken of by 510+ scorers. Supplementing with online videos from KA or YT are also constantly recommended by top scorers. By the way, Troy is a VIP MCAT Mastery member who leveraged our top scorer strategies to increase his MCAT score by 13 points in only 3 ½ weeks! In fact, you can read all about his MCAT success story here. Also, if you’re currently taking any relevant Chem or Physics courses right now, take advantage of this! This is likely the case if you haven’t started MCAT prep yet. But if you are in such a course, do all you can to really understand concept in great depth. Start supplementing with KA or YT videos to really get deep into different topics. As with most sections on the MCAT, you’ll come across really strange/difficult passages. For this section in particular, you’ll realize that these passages generally have the most direct and obvious questions. So don’t worry when you come across one of these passages! Instead, turn your attention to little details that might hint at a specific C/P concept you should know. They're applying MCAT study and testing strategies that they know work for exams of this nature, that require you to think critically, and above everything else, apply your knowledge. Do you believe that 90% of those who will be writing the MCAT with you soon, will be aware of these strategies for C/P? They won't, but since you now are, and if you apply them, that automatically will place you in the top 10%. If you study smarter using unconventional MCAT study hacks, you'll have an advantage over the average premed who's struggling to increase his or her scores right now. "Doing well on the MCAT is not about stressful studying, it's about smarter studying, it's about strategic studying." Get and apply the MCAT prep strategies others have used to increase their scores by 10, 12, even 15+ points to achieve competitive scores and gain admission into the med-school of their dreams, so you can do the same. You know what to do now. You don't need to figure out anything else. It's all been figured out and laid out for you in a straightforward, simple map that you can download as a PDF and start using right away. The path to your highest MCAT score is available to you.